Before I got married, I never cooked, except for the lasagna I would make once in a blue moon, or the one time my mother hurt her foot and I suddenly decided to turn into a responsible daughter and cook something for all of us…for just one day. After I got married I started cooking pretty regularly. I just couldn’t eat out every day, and there’s nothing quite like ghar ka khana. So I worked hard, well almost, all the while annoying (continually so) my mother, and sometimes my aunt for recipes and tips and tricks, and I must say I have gotten pretty awesome at this cooking thing. So very modest, no? 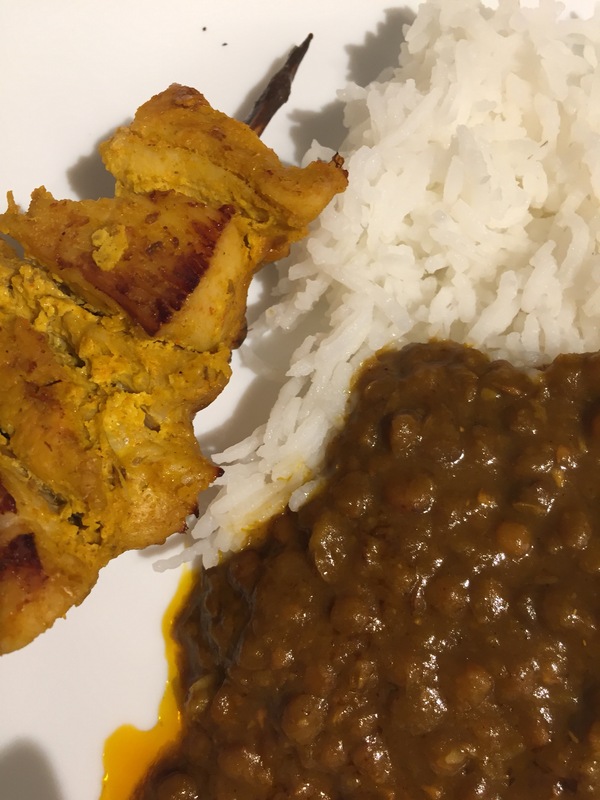 So, now that I have become one of those regularly ghar pe khaana banane waali ladies, I have decided to turn my weekly kitchen escapades into a weekly blog post. Don’t be mistaken, I don’t cook up a feast every day. Far from it, actually. I make only one meal a day, which is dinner, and last night’s dinner becomes today’s lunch unless I really want to eat something else. One day of the week is always for left-overs, and some days I just don’t want to cook, or we want to eat something different so we eat out or order in. Not very glamorous, but hey, c’est la vie. I have no pictures of this because I hadn’t thought of this series until then. Haha! But this kadhayi is different from regular kadhayi. It’s a recipe I got from my friend, and I find it better than regular kadhayi because this is lighter on the spices. Just a regular, very light chicken curry with diced green capsicum/bell pepper. I don’t make my rotis from scratch by the way. These are those refrigerated phulkas/rotis that only need to be cooked on the griddle. Black Masoor dal is my favourite dal. The Chicken Kababs are no particular kind- just some random spices thrown together (basically whatever I could find) into a marinade, and then put into the oven. We had leftovers from the last three days, so those with rice or roti. I love kadhi chawal. It’s one of my absolute favourite meals! Mr. Lucky loves bhindi, so I made that but it came out looking very weird (I put in too much onion) but it tasted good. Since this became a full vegetarian meal, I just fried some kababs that were kept in my freezer (courtesy of my mother), since my husband cannot fully digest a meal without some form of meat. I don’t generally cook on weekends unless we are in the mood for a heavy brunch or we feel like having something in particular. 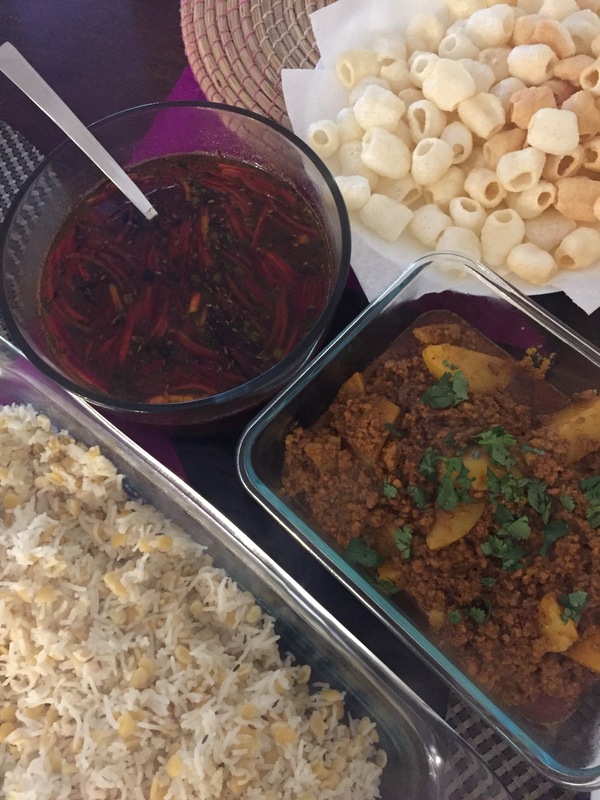 This Saturday I prepared a quintessential Hyderabadi brunch, on Mr. Lucky’s request- Khichdi (a simple rice dish made with dal/lentils), Qeema (ground/mince meat generally cooked with potatoes), and a very watery gravy of sorts made with tamarind called Imli ka khatta. 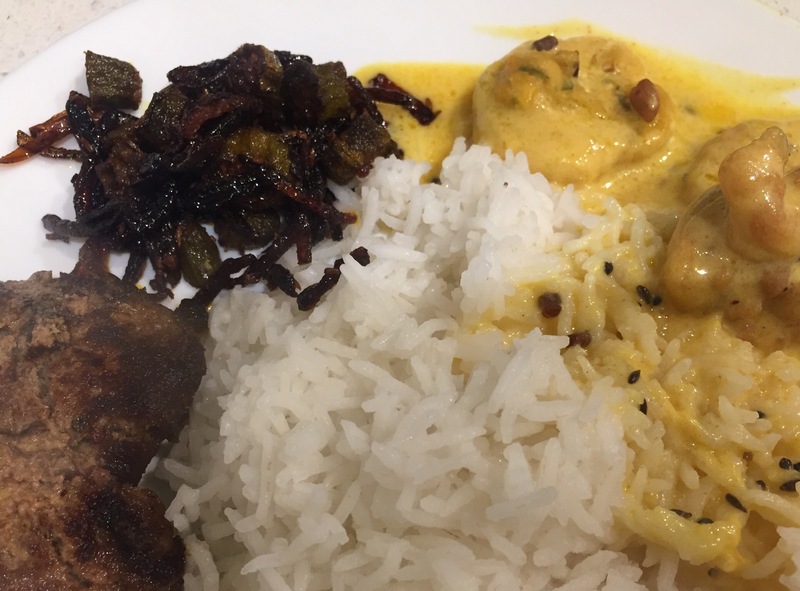 All of this is ideally accompanied by papad (deep-fried poppadums) but I realised only in the morning that I had run out so I just fried fryums instead, kind of the same thing. So, that was this week’s meal round-up. Did I give you ideas for your week? I love cooking. When I was young I used to want to cook all the time, but my mum was OCD (an illness that basically stops others from touching anything) I did learn to cook once she fell ill. 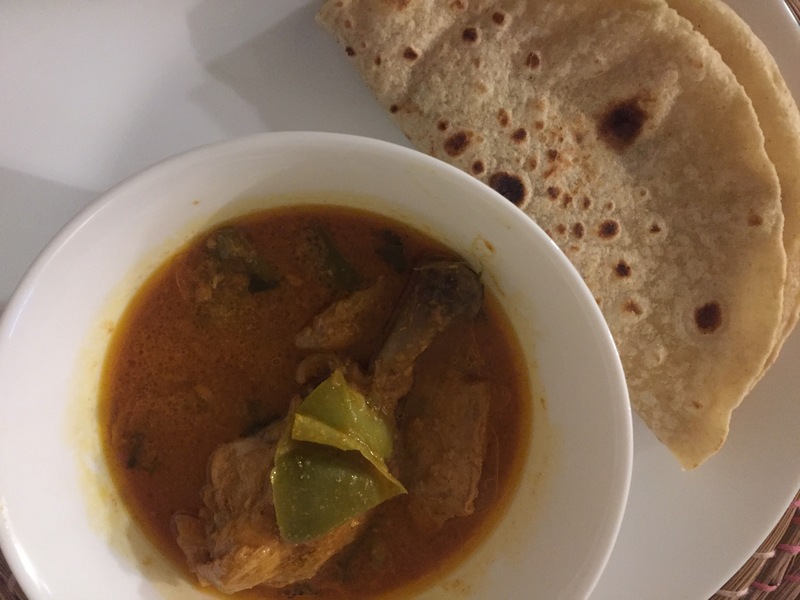 I love cooking all manner of things, I have to say your chicken and pepper curry with roti has got my taste buds humming. Might try that out this week. So how much of the terrible stuff did the hubby have to go through before you finally nailed the cooking skills? Hahah! The poor man still has to go through a lot of terrible stuff! Please check picture of the bhindi for reference! It’s a miracle that turned out tasting pretty okay! HEhehe! Masha’Allah all looks fab! … i dont have a clue what half of those dishes are 😂 but definetly intrigued!! This is great!!! I too started cooking just before I got married and I enjoy it now. I cook each day, and it’s the best way to go! Ma sha Allah, these all look amazing 😍 Well done! So true! No matter how much I cook for us, I miss my mum’s cooking every day! I love seeing weekly menus! That okra looked soo good – do you have a recipe for it please? That’s so cute! I love it when dads cook! And I second what he says, homemade really is the best!